In the midst of a brimming economic growth cycle, with good GDP growth, solid employment and tax revenue flooding government coffers, there should be little to worry about. Yet as I explained the other day, President Trump is on a fast track to outpacing Obama in terms of federal spending. Over his two terms, Obama averaged four percent annual spending growth; if the current OMB forecast holds true, Trump will sign budgets that grow spending by 4.6 percent per year. Next to Bill Clinton, Trump looks like a liberal spender on steroids: throughout his two terms, Clinton held the line at an average of just above 3.1 percent per year. And these are current-price figures. In fairness to Trump, he did not invent the structure of government that we have today. Furthermore, Obama's spending record is due entirely to his disdain for budget compromises with a Republican-led Congress. With the exception of his ridiculous American Recovery and Reinvestment Act, he let the U.S. government live off continuing resolutions. The underlying problem here, therefore, is not that Washington has suddenly been overrun by fiscal conservatives. Although it is fair to classify Clinton as a fiscally conservative president, his commitment to it was more functional than principled. He, Congressman John Kasich and House Speaker Newt Gingrich held back spending growth but maintained the structure of the American welfare state. While rejecting the single-payer Hillarycare idea, they did create SCHIP, "Medicaid for kids", and the PRWORA welfare reform was not firm enough to hold the line on economic redistribution for lower-income families. All in all, over the years the structure of the American welfare state, created in the early days of the War on Poverty, has remained intact. It has even grown with every recent president: Clinton signed SCHIP, Bush Jr. expanded Medicare and Obama gave us Obamacare. Trump may add paid family leave, which would put us right on the doorstep of the Swedish welfare state in the image of which our own welfare state was created. The long-term result of this relentless commitment to the welfare state is that our federal government has become precisely what our Founding Fathers did not want it to be. Their vision of a minimal state with enumerated powers has given way to an economic-redistribution machine. Today, Congress runs an egalitarian behemoth that does not care for the poor, but provides an increasingly comfortable living for about half the U.S. population at the expense of the other half. 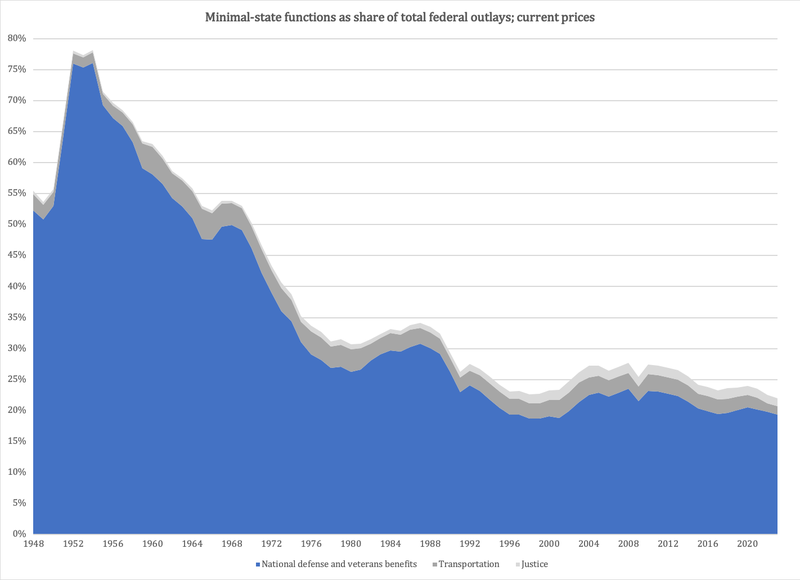 The peak of minimal-state spending in the early 1950s was a return to a wartime economy. It was driven by the Korean war, and could be said to mark a bit of an anomaly in the minimal-state share of the federal budget. Nevertheless, from 1954, the first post-Korea peacetime year, the minimal state accounted for 78 percent of federal spending. Today, that share is at 23.7 percent. National defense is 15.4 percent. 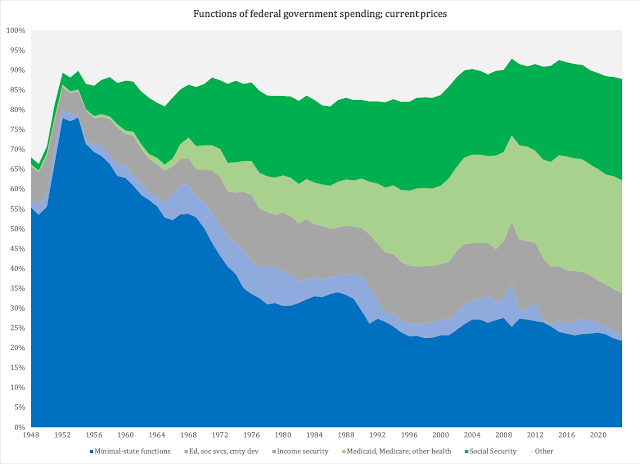 Spending programs that were barely visible in the 1950s now dominate the budget. Retirement, a.k.a., Social Security, has expanded from 4.7 percent of federal spending at the end of the Korean war to 23.8 percent today. That program alone is bigger than national defense, law enforcement and transportation combined. Health care is even bigger at 28.3 percent. It accounted for only 0.4 percent of federal spending in 1954; the reason for its expansion is that Congress created Medicare and Medicaid as part of the War on Poverty. The three programs Social Security, Medicare and Medicaid together gobble up more than 52 percent of the federal budget. Income security, education, social services and community development programs - all redistributive in nature and therefore part of the egalitarian welfare state - add another 16 percent. In other words, we use two out of three federal budget dollars to take money from some Americans and give to others, for purely ideological reasons. Herein lies the explanation of why federal government spending grows faster than GDP every year, and why we have a chronic budget deficit. Two thirds of the federal budget is driven not by what we, or even Congress, wants to spend, but by who is entitled, to what they are entitled and for how long that entitlement lasts. That spending grows by its own momentum; the growth has nothing to do with what taxpayers can or cannot afford. Speaking of taxes: our chronic budget deficit is partly determined by independently growing spending, partly by our obsession with an extremely progressive income-tax system. Today, ten percent of all income-earning Americans pay two thirds of all federal taxes. Fifteen million people pay for the entire egalitarian welfare state. So long as we continue to favor economic redistribution; so long as we prefer egalitarianism to liberty; so long as we think the federal government should spend four times more on entitlement programs than on national defense; we are going to continue to run deficits, pile up debt for our kids and grandkids, and set ourselves up for a fiscal disaster the like of which this country has never experienced. Is that a price worth paying for being good egalitarians?